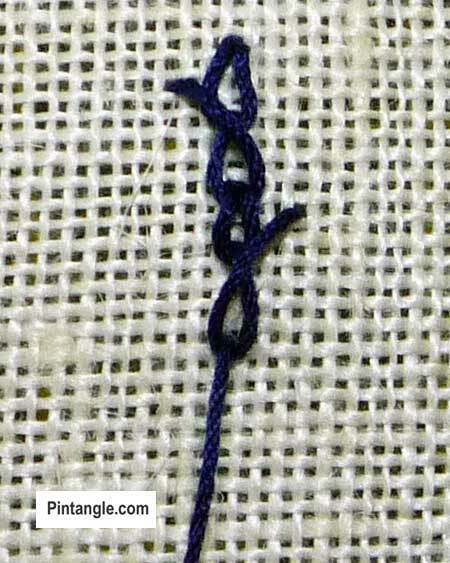 Alternating Barred Chain stitch is one of those interesting textured stitches that you may want to add to your hand embroidery repertoire of stitches. 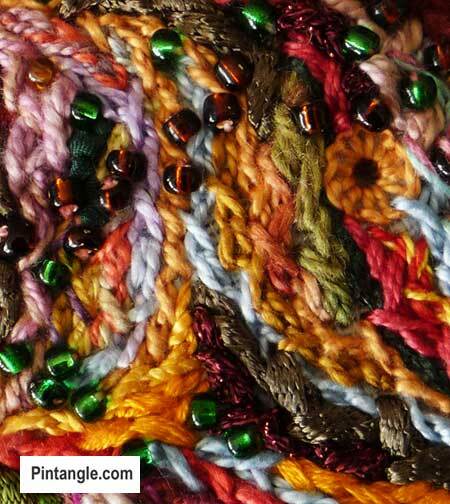 It is an interesting member of the chain stitch family that produces a textured line. I think that Alternating Barred Chain stitch is in some ways more interesting than its sister Barred chain as I like the pattern and swing that is set up by the alternating arms of this stitch. This swing can create movement in a piece. 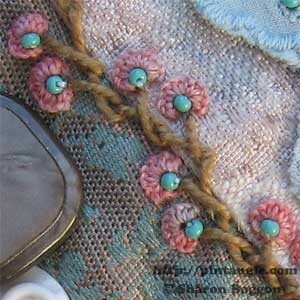 Alternating Barred Chain can be worked easily and quickly and looks great in chunky textured novelty threads. 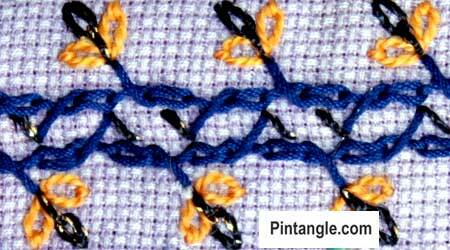 This stitch follows a curve well and is great for creating designs with an organic feel. You can use it to represent a thorny vine or in underwater scenes representing seaweed and marine plants. Work from top to bottom. 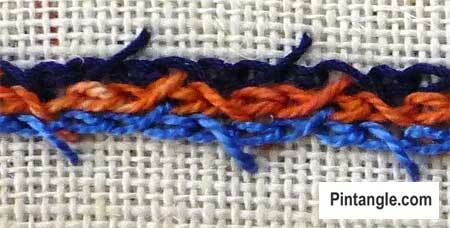 Start with a basic chain stitch. Insert the needle to the left of the chain with the tip emerging a short space down the line. The gap can vary, depending upon how wide you want the ‘spike’ of the chain. The wider the gap the larger the spike. 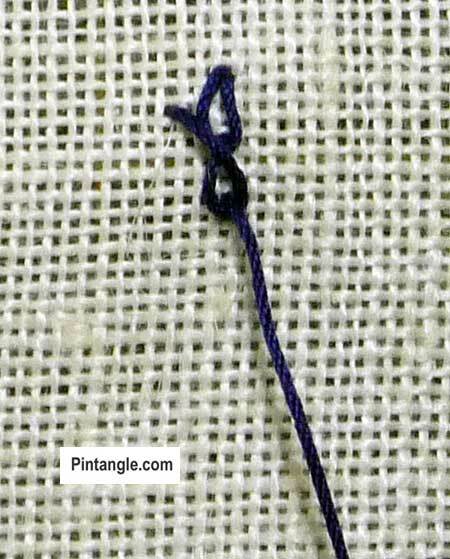 Wrap the thread under the needle point, towards the right as illustrated and pull the needle through the fabric.The thread will cross as you do this, producing a crossed stitch as illustrated. 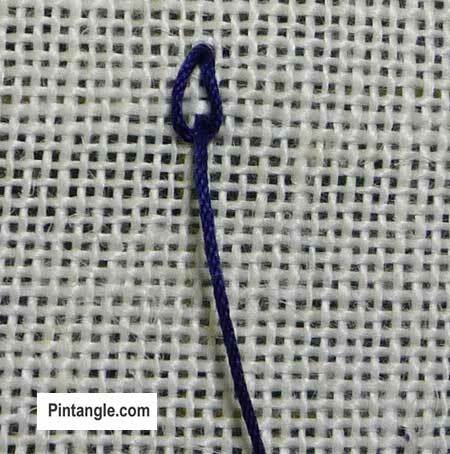 The second stitch is a basic chain stitch. Insert the needle to the right of the chain with the tip emerging a short space down the line. 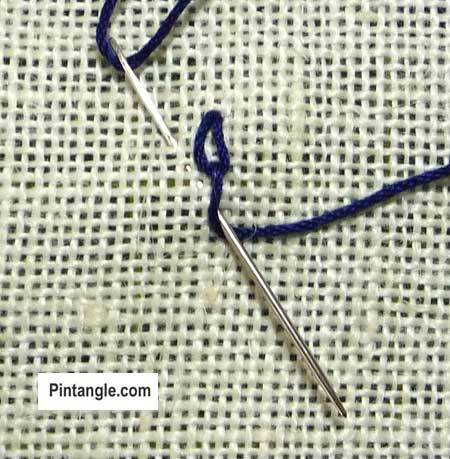 Wrap the thread under the needle point, towards the left as illustrated and pull the needle through the fabric. Repeat this pattern of single chain and barred chain angled left, followed by a single chain, then a barred chain angled right. Alternating Barred chain produces interesting hard wearing bands if you work it row upon row. Or you can set up a pattern by working two rows back to back and arranging the spines in a regular manner. 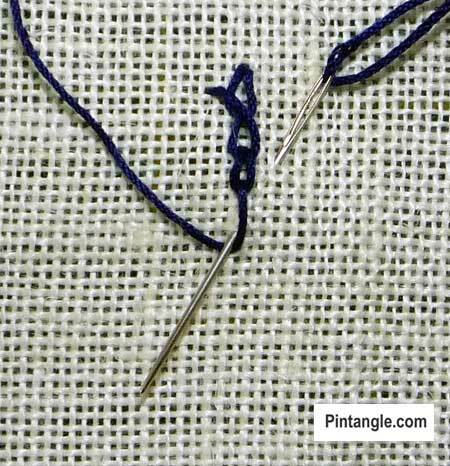 You can change the number of stitches you work on each side too. Of course this creates another variety. 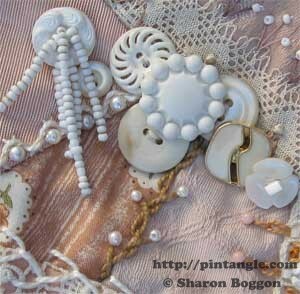 Alternating Barred chain is also an ideal stitch to use in crazy quilting! While I still had the Barred chain stitch in my head, I thought I better get on with the Alternating Barred. Hi sandy yes they are not so hard once you get in the swing! Thank you Sharon. 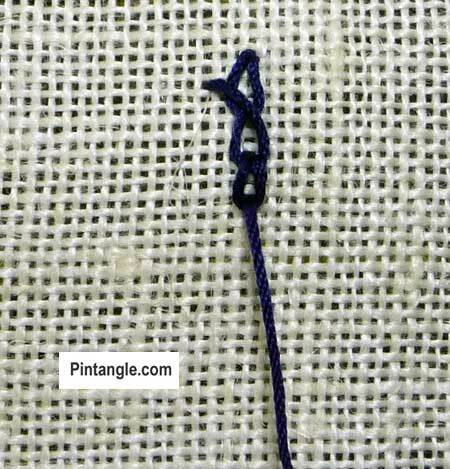 I have never seen this stitch before and certainly want to try it. Thanks Sharon,I love this stitch!???? I love the stitch samples . Cool beans. I hope to give this a try soon. You have lovely work. Great stitch, Sharon. Thank you. I make quite a lot of maritime cards and hangings and this will be really useful.